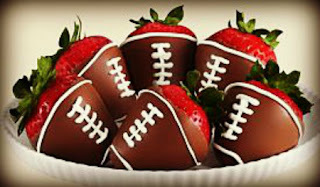 Dying for Chocolate: CHOCOLATE COVERED FOOTBALL STRAWBERRIES: Super Bowl Sunday! CHOCOLATE COVERED FOOTBALL STRAWBERRIES: Super Bowl Sunday! Chocolate Covered Strawberries are always fabulous, but with the addition of some white chocolate icing, you can make fun footballs that will be perfect for your Super Bowl Party. You can buy them from: Shari's Berries (Photo--milk chocolate) or you can make your own. They're easy to make. Not a lot of fuss, and it's fun. Great project to do with kids! The strawberries on the right are dipped in milk chocolate (more football colored), but taste-wise I prefer dark chocolate. It's up to you. Just remember to use the very best chocolate, and the freshest strawberries. Rinse strawberries and dry thoroughly, keeping tops on. In top of double boiler or stainless steel bowl over a pot of simmering water, combine chocolate and heavy cream. Stir until chocolate is melted and mixture is smooth. Dip strawberries 1/2-3/4 way up in chocolate mixture and place on wax paper or parchment lined cookie sheet to allow chocolate to harden. When hardened, decorate with melted white chocolate (see below). Wash strawberries and pat dry with paper towels; set aside. Make sure strawberries are completely dry. A drop of water in melted chocolate can cause it to "seize" and turn the entire mixture into a mess. How to smooth out the chocolate: add a tiny bit of honey and stir. Grasp stem of strawberry and dip into chocolate, swirling to partially cover with chocolate. Give strawberry a small shake as you pull it out of the chocolate. When strawberry is completely out of chocolate, swirl it in quick, clockwise motion to let excess chocolate drip off. Place on cookie sheet lined with waxed paper or parchment. Repeat with rest of strawberries. Melt white chocolate in Microwave on high for 20 seconds or so. Stir and repeat if necessary. Put white chocolate in piping bag. Pipe stripe on top and bottom of strawberries. Pipe line down middle and then do about 5 short cross lines. Tip: Go back over the cross lines to avoid drips.